The Iowa-AAP registered on almost two dozen policy bills filed this legislative session, which ended on April 22. 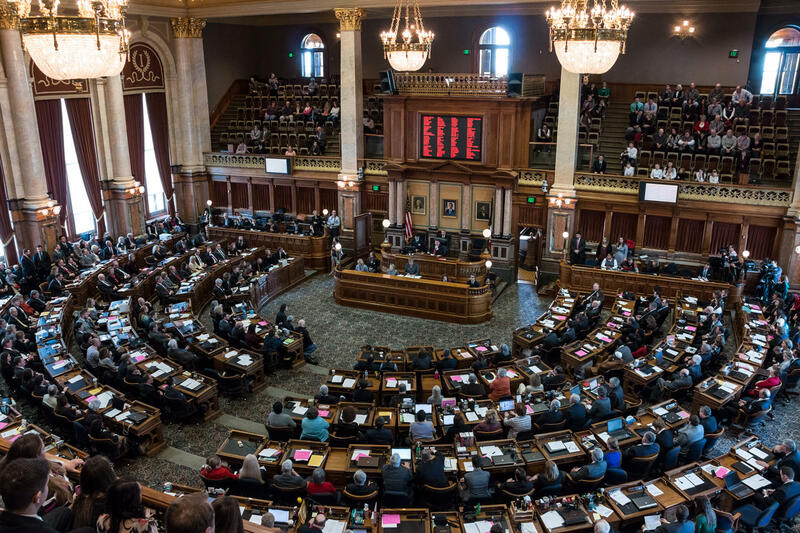 Following is a summary of legislative action on several bills that Iowa-AAP supported, opposed, or registered undecided — along with links to earlier related blog posts. A table with a list of action on all Iowa-AAP policy bills of interest is available. HF 543 expands drug-related caregiver actions that can be subject to a Child in Need of Assistance proceeding and/or a founded child abuse case. The bill also expands reporting requirements for mandatory reporters suspecting that infants are suffering the effects of drugs or alcohol. More. Iowa-AAP SUPPORTED. SF 51 expands education about congenital cytomegalovirus and requires testing for the virus if a newborn fails the required hearing test. More. Iowa-AAP REGISTERED UNDECIDED. HF 517 is an omnibus gun rights bill that removes the former requirement that a child be at least 14 years old to possess a handgun. A parent or other adult must provide direct supervision of the child and is strictly liable for any resulting injuries. More. Iowa-AAP OPPOSED. HF 215 expands insurance coverage for applied behavior analysis to treat autism spectrum disorder. The bill requires that certain individual and group health insurance policies for public employees who are not state employees cover this treatment for children under 19 years old. More. Iowa-AAP SUPPORTED. HF 625 removes the requirement that the Iowa Department of Revenue advise low-income taxpayers with dependent children without insurance of potential eligibility for Medicaid or hawk-i. Iowa-AAP OPPOSED. SF 489 permits sales of fireworks in Iowa, including in open tents, during times around July 4 and January 1. More. Iowa-AAP OPPOSED. HF 7 allows an exemption from compulsory immunization based on someone’s “personal conviction.” More. Iowa-AAP OPPOSED. SF 254 makes it a criminal offense for a licensed health professional to inquire about a patient’s possession or ownership of firearms. More. Iowa-AAP OPPOSED. SF 360 expands “safe haven” options for a parent to abandon a newborn without being subject to criminal prosecution. Iowa-AAP REGISTERED UNDECIDED. SF 11 requires Iowa DHS to assist new mothers receiving pregnancy-related Medicaid to secure private or public health insurance. More. Iowa-AAP SUPPORTED.